The year 2012 marked the birth of a new cycle of time that will last for the next 26,000 years. In charge of such birth is the Great Mother, the eternal source of all creation. She is calling on the feminine within us all to create a world worthy of the next seven generations and begin an era of peace, abundance, and spiritual evolution. To birth this new world, we must release our hold on old destructive patterns and instead embrace the divine feminine qualities of intuition, powerful creativity, and rhythmic renewal. As Christine Page reveals, the Great Mother hears our heart’s yearning to escape our old ways of suffering and struggle to find peace, fulfillment, and joy. She is reaching out to us across the dimensions, offering spiritual initiation and the chance to know ourselves fully right now. Dr. Page explains how important it is to acknowledge and integrate our shadow selves--the unloved parts of us--so we can radiate our light from the fullness of who we are without shame or judgment. Drawing on alchemy and mythology, the author details the journey of the soul through the twelve signs of the zodiac until our inner light shines. 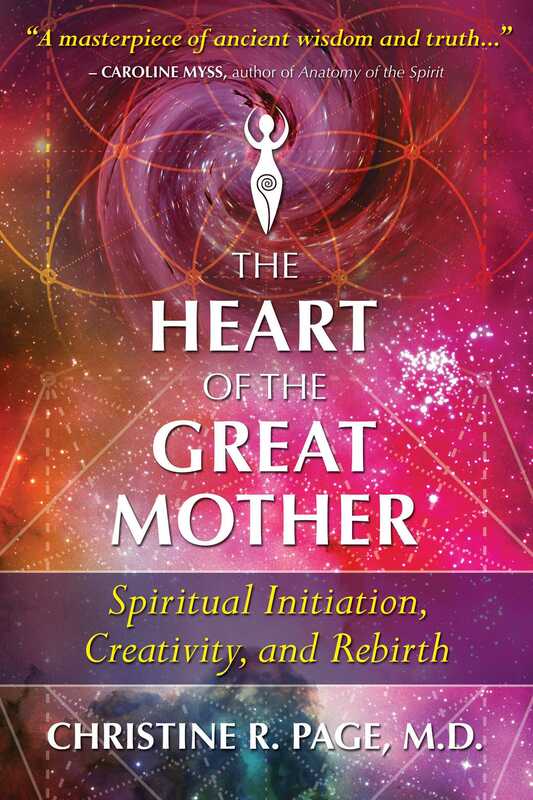 She also explores how to connect with and use sacred spiritual tools to open our hearts and merge with the Great Mother’s love and creative powers. Exploring the mythology of the Triple Goddess, the author explains how the three faces of the Great Mother help us on our spiritual journey of transformation: As virgin she inspires us to manifest our dreams. As mother, she teaches us to celebrate and nurture all living things, especially ourselves. As crone, she shows us that creativity changes like the seasons, encouraging us not to be possessed by our creations but to embrace mystery and impermanence. Finally, the Great Mother emboldens us to build our magician’s wand, the rod of light along the spine which enables us to be masters of our creativity, bringing forth transformation for ourselves and generations of children still to come as we embark into a new era of expanded consciousness and love. It feels natural to begin our journey in the “place” from which everything is born and will eventually return. In our modern world, this is described as Light, God, the Source, or the Great Mother--an all-inclusive energy without differentiation. More scientific terms include the holographic universe, phase space or the void, implying the energetic synthesis of all which has been, and will ever be. For the ancient people, including the Egyptians, Sumerians, and Babylonians, the origin of life was called the primordial waters of no-thingness, possessing strong feminine characteristics such as darkness, chaos, and fiery creative power. In other words, in the beginning was powerful feminine potentiality, similar to the matrix, awaiting fertilization into form. As we continue to explore the ancient Creation Myths, we learn that the primordial waters of the Great Mother give birth to herself, creating the Triple Goddess, consisting of the three archetypal faces of the feminine. Each face is essential for the complete creative process and together they express the divine power of the Great Mother. The Virgin represents creative inspiration, the Mother creative nurturing, and the Crone creative transformation. All three of them act exclusively through their unique style of compassion and intuition, ever expanding our awareness of ourselves toward our perfect eternal state. Traditional wisdom tells us the Triple Goddess was honored as far back as 25,000 BCE. But in the past 3500 years, under patriarchal rule, the Goddess and everything associated with the feminine (intuition, emotions, and rhythmic cycles) have been suppressed or denigrated. Yet without the embodiment of these gifts of the Triple Goddess, whatever our gender, we will be unable to fulfil our soul’s destiny. Intuition maintains the connection to our soul’s blueprint. Emotions act as the force behind all creativity and transformation. Cycles ensure evolution through transformation which occurs through inspired growth, embodiment of wisdom and the release of old patterns or things which no longer serve us. Let’s consider each aspect of the Triple Goddess in turn. Contrary to popular belief the word Virgin does not reflect a sexually inexperienced girl but instead means “to be complete unto oneself without the need for another to make one whole.” Often depicted wearing white, the Virgin radiates a state of energetic perfection where she is comfortable with herself and has nothing to hide. An analogy would be that when we buy a jigsaw puzzle, the picture on the front of the box reveals the ultimate expression of wholeness, and yet it is only through working patiently with each piece that the picture is recreated from the building blocks within. • Our holographic self in which everything is essentially present As we deepen our study of the Virgin within mythology and her relationship to wholeness and purity, it’s easy to recognize her within the Christian world as the Virgin Mary. Unfortunately, her radiant pure light of authenticity has often been misinterpreted as possessing purity of thoughts, words and deeds, especially of a sexual nature. These twisted dogmas were set in place thousands of years ago by a patriarchy who wanted to control women and who determined that, by creating an nattainable role model, women would always feel ashamed of their femininity. But if we return to the original meaning, imagine being in a relationship where you knew you were “complete unto yourself, without the need for another to make you whole.” We would still enjoy the creative charge which comes from intimacy but without the fear of rejection, the stickiness of co-dependency or the burden of unrealistic expectations commonly placed on another person to make us whole. Imagine the joy of just being in the presence of another soul who knows and trusts his or her implicit wholeness and allows you to do the same. On an esoteric level, the Virgin’s surety of who she is equates to the fact that, dwelling as she does within the unified field where there is no separation, she has no concept of another but only an appreciation of us. There is no doubt that, of all the aspects of the Triple Goddess, the Crone is probably the most difficult for an individual to accept and integrate, being both revered and feared within most cultures. Known as the Old Woman, the Wise One, the Dark Mother, and the Hag, she is commonly portrayed as being bloodthirsty, sexually promiscuous, and extremely ugly. The territory she rules is seen as chaotic, representing the unknown and untamed aspects of our nature, which is why, those who like to stay in control, find her appearance in their lives so disturbing. Representations of this powerful feminine archetype include Kali the destroyer, Cerridwen the corpse-eating sow, Sekhmet the fire-breathing lion, Isis the vulture queen, Morgan Le Fay the death queen, and Persephone the destroyer; no wonder she has acquired such a reputation! All represent death, winter, destruction, and doom. Indeed, the Grim Reaper, seen brandishing his scythe as a sign of impending death, originates from an ancient Scythian goddess whose symbol, like that of many of the death goddesses, is the dying crescent moon. As we will discover, each cultural myth surrounding the Crone offers a different perspective of her archetypal energy, although all agree, this is one powerful lady! Christine R. Page, M.D., began her medical practice in London in 1978 and combined it with homeopathy in 1989. She is an international seminar leader on subtle energy and energy medicine, having created a three-level training program to enhance the power of intuition for health care professionals. She is the author of Frontiers of Health: How to Heal the Whole Person and Spiritual Alchemy. She lives in California.